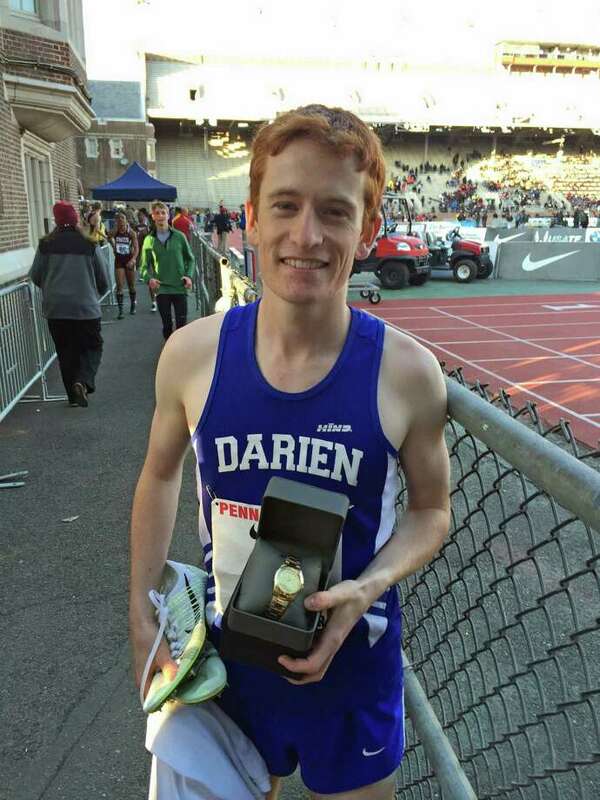 Alex Ostberg poses with a watch, his prize for a victory at the Penn Relays. Alex Ostberg became a Penn Relays Champion on Friday with a victory in the 3000 meter High School Championship race. Ostberg crossed the line in 8:23.95, claiming victory with a late surge to hold off Aidan Tooker of Saratoga Springs, NY. "Alex was incredibly comfortable in the race," said Tyson Kaczmarek, Head Coach. "If you go back and look at the video, Alex is in complete control the entire time. Even in the last 400, Tooker is running full speed and Alex remains poised. The tactical race unfolded completely in Alex's favor. This was an extremely good sign of very positive things to come." The first mile unfolded at a slow pace in approximately 4:34. Ostberg used a strong 60 second last 400 to hold off the competition. "Winning Penn Relays is a huge deal. Not many people can lay claim to that title. Alex has worked incredibly hard for that." In addition to Ostberg, junior Armstrong Noonan placed ninth in 8:41.01. Noonan's race was superb considering he lost his shoe -- on the second lap. "Army was mentally tough today. His shoes came off on lap two so he ran most of the race with only one on. The thought of dropping out or stopping never crossed his mind and to run the time he did on one shoe is excellent. With both shoes, that is 10 seconds faster for sure." Meanwhile, at the O'Grady relays, a pair of school records were set. First, the 800 medley team of Lucas Thompson, Dillon Foley, Charlie Wolf and Santosh Krishnan placed fifth in 1:43.64. The time was significant because it also qualified the team for the Emerging Elite Race at New Balance Outdoor Nationals. "The 800 medley team ran in extreme conditions -- cold, wind and snow flurries -- and still was able to qualify for Nationals. It was an incredible race as they had to be mentally tough to fight through the conditions." In addition, the 4 x 110 Shuttle Hurdle team of Ari-Singer Freeman, Henry Vossler, Ted Woll and Kenny Yamaguchi placed 4th in 1:22.59 to also claim a school record. The 4 x 1600 relay team of Jason Flynn, James Fay, James Johnson and Jimmy Conroy were second in 19:38.07. On Saturday's scoring portion of O'Grady Relays, Darien fared well, placed sixth overall with 34 points and third in the Medium Division with 72 points. The team was led by the second place finish of the long jump relay. Shelby Grant, Sam McMullin and Max Grant combined for a mark of 56-11.25. The trio also placed sixth in the triple jump relay in 111-11.5. The 4 x 800 team of Flynn, Fay, Arthur Cassidy and Keenan Warble were third in 8:23.96. The pole vault team of Yamaguchi, Woll and Vossler were third with 27-0. The javelin relay team of Carter Ashcraft, Cassidy and Jack Young placed 4th with a total of 389-7. Young joined Jack Tyrrell and Charlie Zuro to place seventh in the shot put relay at 112-6. The 2000 meter steeplechase relay team of Johnson, Jack Murray and Singer-Freeman was sixth with a total time of 22:17.02. The 4 x 400 team of Fay, Flynn, Ashcraft and Michael Belloli was eighth in 3:42.09.